Not sure if you need to hire more staff at your archery shop? Answer these four questions to find out. Is your business’s to-do list never-ending? If you answered “yes,” then it might be time to hire help. It’s important to acknowledge when you should fill those gaps to ensure your business grows and prospers. Anthony Schmidt, assistant vice president at La Crosse Archery in Wisconsin, often advocates for hiring help. His family’s store has four full-time employees and 11 part-time or seasonal employees. Schmidt said shop owners must look in the mirror and determine how and where they need help. Next, write a job description and hire a person with the right skills and personality to complete those tasks. What if you’re unsure you need to hire help? Let’s review four situations that might indicate you do. 1. Do you work more than 50 hours per week? Shop owners juggle many responsibilities, but continuously working long hours is neither healthy nor sustainable, Schmidt says. Consider hiring a full- or part-time employee to help run daily operations or administrative tasks. That will free up your schedule so you can focus on long-term business goals, further ensuring your business and marketing plans stay on track. 2. Does your shop need a deep-clean? 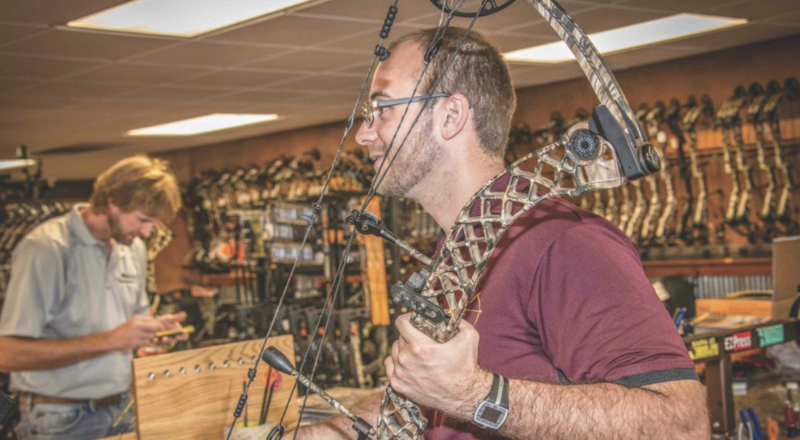 Imagine a customer walks into your archery shop and finds cobwebs, unswept floors, and dust on the shelves and products. Dirt and clutter might make them overlook what you’re selling, and take their business elsewhere. Impress customers with good merchandising techniques and a well-maintained shop. If you can’t make cleaning a priority, delegate those responsibilities. 3. Do customers often wait? Customers want to be acknowledged. They must know you care about their needs and feel invested in their success. To make your customers a priority, introduce yourself, be kind, establish rapport and show you’re there to help. If you can’t give customers undivided attention, consider hiring a sales representative or certified instructor to fill the gaps and focus on customer needs. Teach them the art of selling, and then watch your customers’ satisfaction soar. 4. Is Updating Social Media a Hassle? According to the website Inc., consistently publishing content helps generate leads, boosts brand awareness, engages your audience, establishes authority and credibility, and improves website traffic and search-engine optimization (SEO). If you don’t regularly publish fresh content, readers lose interest in your website and your social media accounts. Consider hiring a part-time college student to manage your online presence. It’s an excellent way to stay relevant and keep customers engaged in your business. Although many archery retailers think they can’t justify extra help, Schmidt said the return on investment is huge. He suggests hiring an employee for 10 hours a week to test the need. If you need help with the hiring process, the Archery Trade Association’s Retail Growth Initiative (RGI) provides tools and techniques to help improve your profitability. The program’s free resources help ATA-member retailers navigate the hiring process with customizable job descriptions, interviewing advice and tips for promoting the job. You don’t need to reinvent the wheel. The ATA’s effective resources save retailers time and energy, and can boost your confidence throughout the interview process to find the right candidate. Contact Nicole Nash, ATA’s member-outreach manager, at nicolenash@archerytrade.org; or Kurt Smith, ATA’s senior manager of retail programs, at kurtsmith@archerytrade.org to request RGI resources or more information.